Sprawling housing: Residential densities of fewer than four units per acre in urban (sewered) areas, and densities of more than one unit per ten acres in rural (unsewered) areas. Consensus Forming on Anti-Sprawl Laws? “Land-use legislation that sailed through the Assembly last winter played an important role in drumming up support for controlled growth. The law requires a Virginia Department of Transportation impact statement when localities make land-use decisions affecting roads. When VDOT issued its first such report, the forecast stopped the Loudoun County debate dead. Predictions of three-county gridlock spurred a 5-4 vote that could ultimately half a prospective 37,000 new homes…. Serious legislators in both parties recognize that government will never get a handle on transportation spending so long as local governments can approve growth willy-nilly, while passing to the state the tab for maintaining a huge network of roads. One plan under consideration would require suburban counties to maintain portions of their own ever-expanding network of roads. That job currently falls to the state under laws written when Virginia was a rural domain three-quarters of a century ago. As tentatively outlined by Del. Clay Athey, R-Front Royal, a former mayor who understands land-use issues, counties would get a road maintenance allowance from the state, much as cities do today. They might also share in the presumed savings if the locality – rather than VDOT – oversaw the work. Impact fees on development in more rural areas of such counties might steer growth toward density. From an article in Bacon’s Rebellion’s Road to Ruin Series, Spotsylvania County is going to spend $144 million to expand its secondary road network but, no one is reforming the auto-intensive development that spurs on demand for roads in the first place…. Hanover County’s "Land/Capacity Demand Report"
This is the Land-Capacity Demand Report presented at the August 20th Joint Work Session of the Hanover County Board of Supervisors, the Planning Commission, and the Economic Development Authority. 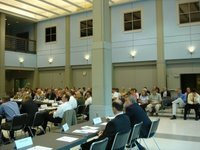 On August 30th, just prior to Labor Day weekend, over 50 citizens attended the third joint workshop of the Board of Supervisors, Planning Commission and the Economic Development Authority. The meeting was facilitated by Clarion Associates and McKinney and Company, consultants to the county. Planning Director Mike Crescenzo, in opening remarks, stated that “this is the first major revision to the Comprehensive Plan since 1982.” In fact, the Comp Plan update is being pushed through one year ahead of schedule. No citizen input has been permitted at any of the joint workshops to date; however, four public workshops have been scheduled in October. These scheduled workshops are taking place much later in the process and are fewer in number than in previous years. Supervisor Robert Setliff, Chickahominy District, stated the revision process began early “because we need more economic development.” That perceived need is being addressed by proposed expansion of existing Suburban Service Areas (SSA). Other than an obvious link to I-295 and I-95 interchanges, no rationale was provided for the choice of these specific locations. CHF agrees with Supervisor Chair, Charles “Chuck” McGhee, who stated: “We need to protect the jewel God put in place, like our agricultural resources.” Art McKinney, of McKinney and Company commented, “We must be good stewards…the community needs to agree on where we want to go.” Why then, is the Citizen’s Survey majority opinion, clearly voicing support for preservation of Hanover’s rural character, being overshadowed by a persistent focus on economic development? CHF is conducting an education and public advocacy campaign to address the need for greater citizen awareness and participation in determining future development in Hanover County. This is what the county should be doing as well.